I was recently in Amsterdam for a long weekend on a business trip, and although I was in a conference hall all day (albeit one with a view! ), I was free to explore the city at night. Stuttgart has some great restaurants, but there's really something special about Dutch cuisine. They seem to have perfected small bites and international fusion, making Amsterdam a real foodie playground. Luckily, I was able to visit some favorites that I blogged about in my last post, including Café de Prins, Arendsnest, and Fier. None failed to please me during this second time around, but I also got the chance to visit two new locations that took my love of Amsterdam to a new level. My husband actually recommended Boca's to me. He found their Jordaan location quite by chance when he was on his own business trip back in the fall. When he raved about their food, I knew I had to try them for myself. We had to make a reservation a week in advance, and I'm so glad we did because the restaurant was packed when we arrived around 7:00 pm. The kitchen serves food much like a Spanish-style tapas bar, complete with an ordering form. Luckily, they have the form in both Dutch and English, so it was easy for us to see what we were getting. For our first round, we ordered the hamburger with foie gras and truffle mayonnaise, steak tartar with quail egg, three types of fries in paper bags (curly fries with truffle mayonnaise, french fries with mustard mayonnaise, and 'raspatat' with Boca's sauce), and the Boca's platter with a combination of meat, fish, and cheese. The hamburger was the first to go. The foie gras absolutely melted in my mouth, and the combination with truffles was simply delicious. The curly fries were also of special note, especially with the mustard mayonnaise, and Matt couldn't get enough of the Irish porter cheese on the mixed platter. Not quite satisfied with our first order, we decided to add the sauerkraut and mashed potato with jamon Serrano shavings, smoked duck, and gravy of port wine and the mini "kapsalon" (a Dutch dish with fries and grilled cheese) with chicken and everything else on top. I'm so glad we saved room for them, especially the "kapsalon". I know the number of fries we had was probably overkill, but who can resist fries with grilled cheese on top? Last but not least, we ended our meal with the Spekkoek (layered spiced cake). 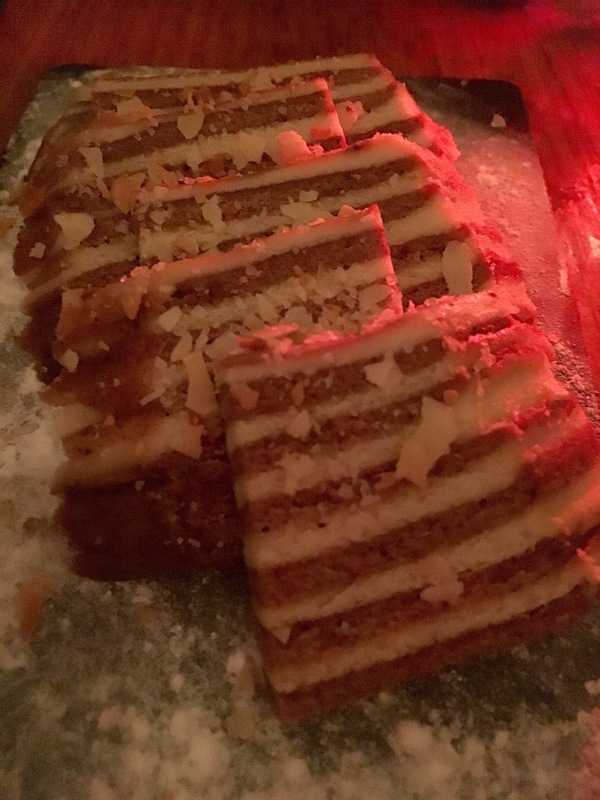 The cake was cut into five slices of about a centimeter in thickness, each one moist and perfectly spiced. It was a delicious way to end our indulgent meal. Though we'd originally intended to try Swieti Sranang again on our last day in the city, the café was closed. And so, we found ourselves (quite fortuitously!) in Boca's once again for lunch. Their lunch menu was a bit different, and we didn't realize until we made our selections that we had in fact ordered a number of small sandwiches. We tried the mature cheese from Rotterdam with whole grain mustard and Amsterdam onion, carpaccio of scallops with jamon Serrano and mayonnaise of pigment d'Espelette, gammon pâté with red fruit coulis, bresaola with slowly cooked sauerkraut, chorizo sausage with roasted bell pepper, Peking duck with hoisin-caramel sauce, lobster roll with cognac mayonnaise and fennel, and hazelnut paste with sugared almonds. Surprisingly, my favorite was probably the simplest one: the Rotterdam cheese. You really just can't beat a good cheese sandwich (and the Dutch have some of my favorite cheeses), although each sandwich was really excellent. I found De Foodhallen on Facebook thanks to a like by Eating Amsterdam Tours, the company that we took our food tour with on our last visit to Amsterdam. Intrigued, I decided to check it out while I was there. Out in the west part of the city, De Foodhallen looked like an old brick warehouse with all of its vendors lined along the walls like stalls in a European market hall. In the center of the hall were a number of tables for guests, along with several themed bars. The set-up was absolutely perfect for me: gourmet food and variety all in one place! My first stop was to the gin bar in the center of the food hall for a drink. I'd seen several people walking around with what looked like giant bowls for mixed drinks. The menu was very impressive, with each drink based off of a different kind of gin. 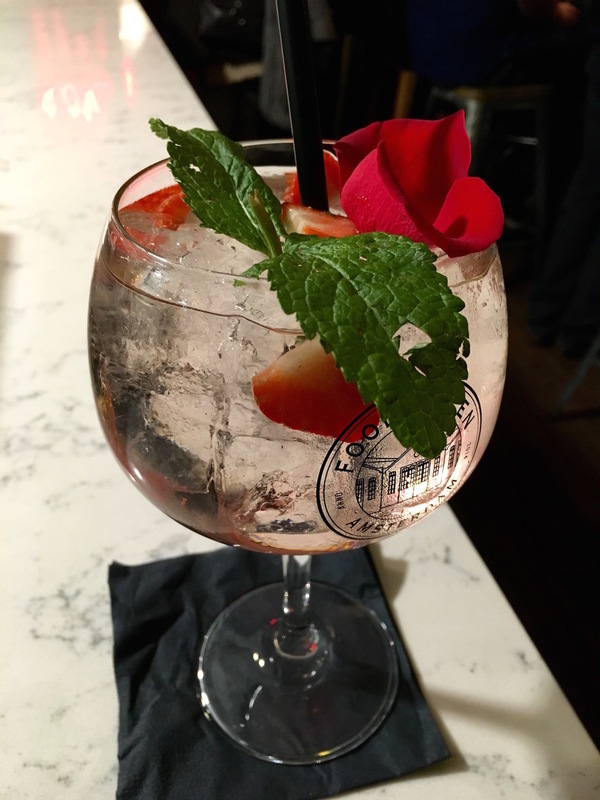 I decided to try the weekly special, called Frenchie The Bulldog, with Fentimans rose lemonade, Bulldog gin, rose petals, mint, and strawberries. Delicious! Our next stop was to try the Chicken Tikka Kebab at the Shirkhan stall. 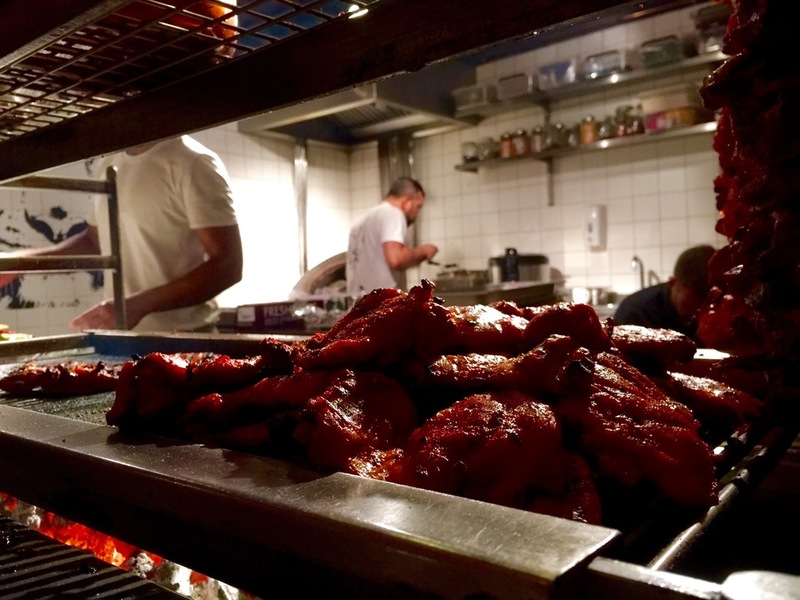 Geared as "high-end Indian street food", we were drawn to the flaming chicken tikka on the grill. The chicken was pretty great, but the real star for us was the soft, chewy flatbread with its patches of browned crust as it has proven to be hard to find a good naan in Stuttgart. 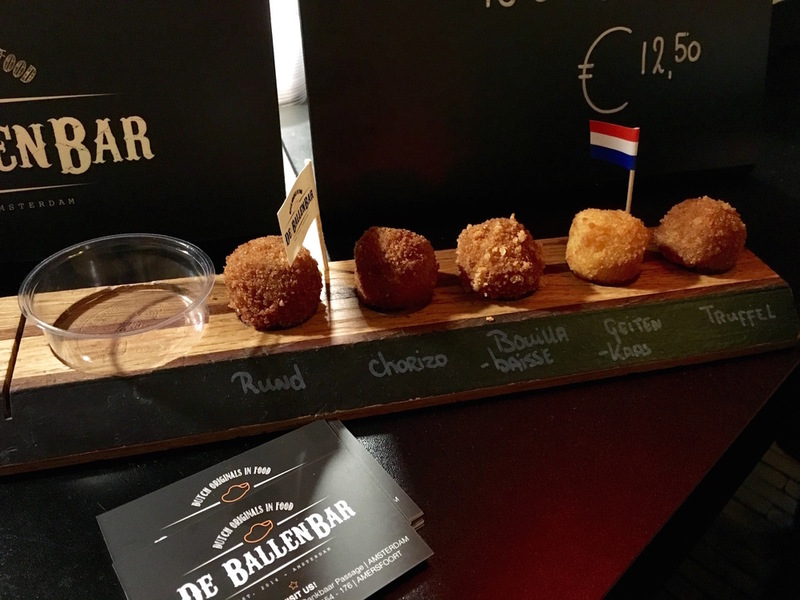 Next up, we made our way to De BallenBar to try a flight of Five Bitterballen (Dutch fried gravy balls), including beef, chorizo, bouillabaisse, goat cheese, and truffle. My favorite was probably the goat cheese as it was so rich and creamy, though all of them were pretty tasty. 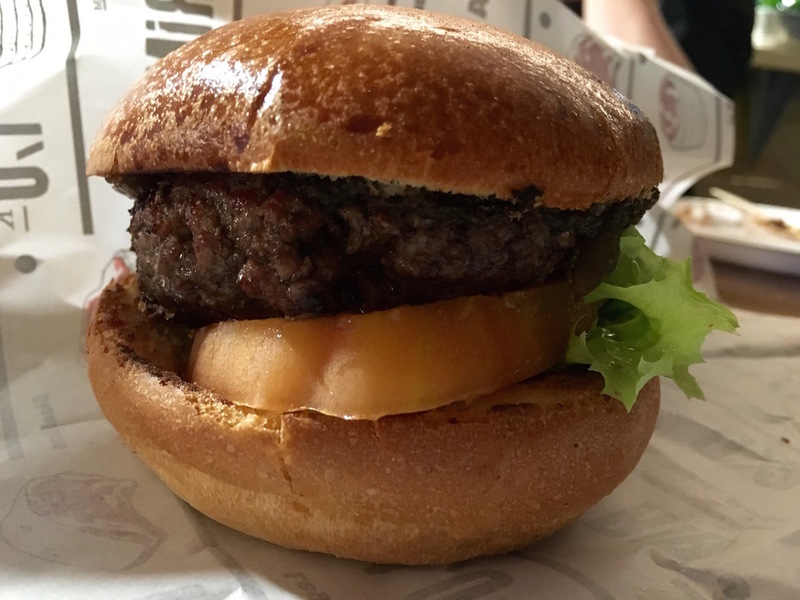 After that, I made my way to The Butcher to try one of the thick burgers that I'd seen people getting (another perk of eating at a food hall). I ended up with the Truffle Burger with lettuce, tomato, grilled onion, and truffle glaze. The beef patty was perfect: thick, juicy, and cooked to a medium rare. They had some really delicious fries in a bag, too. Last but not least, we stopped at Petit Gâteau for some of the enticing pastries that we'd been passing all night long. 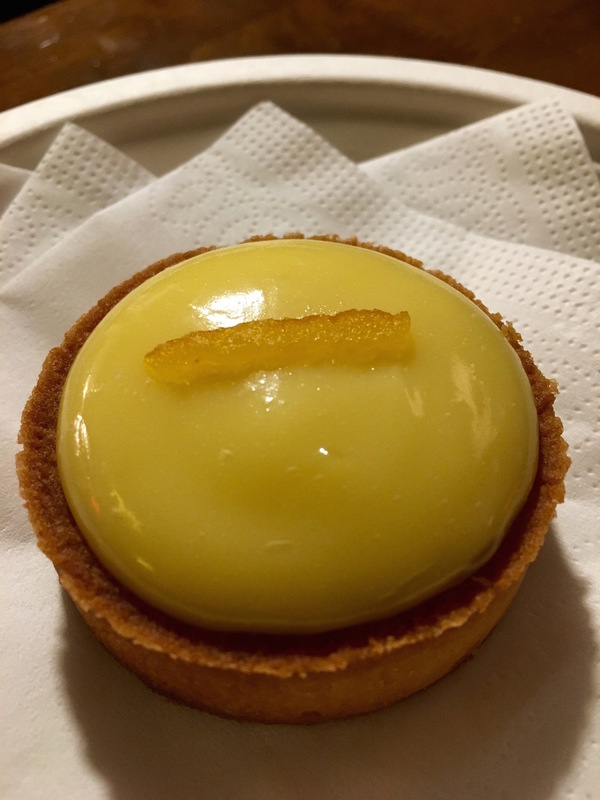 We tried the Pistachio Tart and Chocolate-Speculoos Tart, and even went back for seconds to get the Lemon Tart. They were small and perfect for dessert, with delectably thick cookie crusts. I only wish I'd have been able to fit more food in my belly so that we could have tried more of the stalls while we were there. Boca's and De Foodhallen have, without a doubt, both made it onto my must-go-to-list for Amsterdam. The city just has so much to offer in terms of Foodie culture, that I can only hope to return again soon (or live there one day). Have you been to Amsterdam? What are your favorite restaurants there?